Screening for prostate cancer is controversial for reasons outlined in this article from the Wall Street Journal, but now it is taking a new turn. The government is becoming more aggressive in determining what high quality care is. Before they would not pay for certain tests or medications that were unapproved. Now, they will actually penalize doctors. This goes way beyond educating the public. It interferes with shared decision making by patients and their doctors. Medicare officials are considering a measure that would penalize doctors who order routine prostate-cancer screening tests for their patients, as part of a federal effort to define and reward quality in health-care services. The proposal, which hasn’t been widely publicized, has prompted a flurry of last-minute comments to the Centers for Medicare and Medicaid Services, including more than 200 in the past two days, virtually all in opposition. The official comment period began Oct. 26 and ends Friday. Many of those commenting said the measure would discourage doctors from discussing the pros and cons of screening for prostate-specific antigen (PSA) with their patients and allowing them to decide, as several major medical groups recommend. The proposed measure is part of continuing federal efforts to develop ways to identify and reward value in health care. The Obama administration has said it plans to tie 50% of Medicare payments to such quality measures by 2018. Since 2012, the U.S. Preventive Services Task Force has recommended against routine screening for prostate cancer for men of any age on the grounds that the benefits don’t outweigh the harms. Studies have shown that screening reduces the risk of death from prostate cancers only minimally, if at all, because most grow so slowly they effectively are harmless. Meanwhile, about 28,000 U.S. men die annually from aggressive prostate cancers, often despite getting regular PSA tests and fast treatment. Blood Pressure: How Low Do You Go? This article got a lot of press and a lot of patient’s questions when the study was ended prematurely several months ago. I couldn’t answer patient’s questions on the news release because the study hadn’t been published. Now it has been on November 9th and the results only apply to high risk patients who are being treated for hypertension. Bottom line:Treating to a lower blood pressure goal in high risk individuals may be of benefit, but it comes at a potential cost. Here is the summary from Journal Watch. Dr. Brett is editor-in-chief of NEJM Journal Watch General Medicine, from which this summary was adapted. See full coverage at the link below. Treating to a systolic blood pressure target of 120 mm Hg lowered the incidence of adverse cardiovascular events in a high-risk population, according to the SPRINT study published in the New England Journal of Medicine and presented at the American Heart Association’s annual meeting. Researchers enrolled roughly 9400 patients (age 50 or older) with a systolic BP of 130 to 180 mm Hg and high cardiovascular risk but without diabetes or stroke. Patients were randomized to either intensive or standard treatment (systolic BP targets, 120 or 140 mm Hg, respectively). The researchers were permitted discretion in choosing drug regimens. The trial was terminated early after a median follow-up of 3.3 years, during which participants’ average systolic BPs were 121.5 mm Hg and 134.6 mm Hg in the intensive- and standard-treatment groups, respectively. The primary composite outcome (myocardial infarction, non-MI acute coronary syndrome, stroke, heart failure, or CV-related death) occurred in 5.2% of intensive-treatment patients and 6.8% of standard-treatment patients. Two individual components of the composite outcome were significantly lower with intensive treatment — heart failure (1.3% vs. 2.1%) and CV-related death (0.8% vs. 1.4%). All-cause mortality also was significantly lower with intensive treatment (3.3% vs. 4.5%). Several serious adverse events were significantly more common with intensive than with standard treatment: incidences of hypotension, syncope, and electrolyte abnormalities were each about 1 percentage point higher, and incidence of acute kidney injury was about 2 percentage points higher. Among patients without CKD at baseline, the incidence of a >30% decline in glomerular filtration rate was significantly greater with intensive treatment (3.8% vs. 1.1%). SPRINT has demonstrated that aiming for a systolic BP of 120 mm Hg can lower the rate of adverse cardiovascular events; to prevent 1 event, 61 patients had to be treated for 3.3 years. Keep in mind that SPRINT was limited to middle-aged and older patients at above-average CV risk and that diabetic patients were excluded. Whether the decline in GFR associated with intensive treatment represents a harmless hemodynamic effect or more-serious renal injury is unclear. Clinicians must understand that BP measurements in this study were based on the average of the three readings, taken automatically at 5-minute intervals with no clinician in the room. This method yields substantially lower readings than does a single measurement by a clinician. If SPRINT is applied without attention to proper BP measurement, substantial overtreatment — with a higher rate of adverse events — likely will occur. Finally, note that the average achieved systolic BP in the intensive-treatment group (121.5 mm Hg) remained higher than the 120 mm target. This likely represents judicious balancing by treating clinicians who tried to approximate the 120 mm goal while avoiding side effects and excessive polypharmacy. André Sofair, MD, MPH: This well-designed study reiterates the importance of individualized blood pressure control. It demonstrates that in certain high-risk patients, more aggressive BP targets may be warranted. Blog Is Back! Should Doctor’s Go Bare? I was having technical difficulties that prevented me from blogging for the past month. Fortunately, these have been resolved. The white coat is a time honored symbol of the medical profession. Medical schools have a White Coat Ceremony where they are given their white coats. I gave up white coats 12 years ago because I felt that they intimidated some patients possibly contributing to “White Coat Syndrome” and because I also felt that they could, like doctor’s ties, transmit disease. More people have been advocating recently that doctors abandon this tradition. Hospital-acquired infections and the rise of drug-resistant organisms has put new focus on whether requiring doctors to go “bare below the elbows” (BBE) would help infection control. BBE means no long sleeves, no neckties, no wristwatches, no jewelry other than a wedding band, and generally that physicians will wear scrubs. The practice was adopted in the UK in 2008. But it appears to be a tough sell in the US. At a debate today at IDWeek 2015 in San Diego, two physicians squared off in a friendly—and highly entertaining—debate. Michael Edmond, MD, MPH, MP,of the University of Iowa Hospitals and Clinics said his hospital is going BBE January 1, 2016. He took the “yes” side of the debate. Neil Fishman, MD, of Penn Medicine in Philadelphia, PA, took the “no” side and closed his debate with a hip-hop style rap. Edmond began by citing studies that showed how dirty and microbe-contaminated lab coats could get. Though some surveys have shown patients prefer to see their doctors in coats and ties, “Patients preferences vary” and the survey techniques may bias the answers, he said. Edmond said he was convinced that BBE would help infection control since staph and other organisms persist on clothing, lasting over a month on white coats, particularly if they are polyester not cotton. One survey showed the iconic white coats are laundered infrequently, with about half the physicians in one survey saying they washed them once a month. “Quite appallingly, 20% said they had never washed them,” Edmond said. Though there have not yet been any random controlled studies showing that patients treated by physicians wearing white coats and ties had higher rates of preventable infections that those treated by BBE physicians the concept “has biologic plausibility,” Edmond said. Further, trying BBE has “no risk, except to some people’s egos” and minimal cost. Nonsense said Fishman. “There is no evidence that BBE works,” he said. With all the headaches and challenges physicians and hospital face “You want us to be fashion police too?” Fishman presented a slide show that featured hairy forearms, tattooed forearms, and arms of men with plaque psoriasis, suggesting that baring forearms could be unprofessional and even hazardous. And what about the “commit to sit” doctrine that encourages physicians to talk to patients at eye level, not tower above them. “Will going bare below the knee be next?” he asked. Edmond, showing photo of a filthy white coat he said belonged to a coworker, said it was simply common sense to think BBE would be safer and cleaner. “Your mother would tell you that,” Edmond said. Fishman responded with quotes from a UK physician who charged that the BBE practice of wearing scrubs had led to a “less robust view of infection control” in which physicians began to neglect hand-washing and acquired “a slovenly personal appearance.” Other complaints were that doctors never knew what time it was and had “no place to put their stuff,” he said. In a straw poll after the debate, the audience sided 58% to 42% with Fishman, who at one point showed a slide of himself in a white coat, his arm around the shoulders of a life-sized cutout of Pope Francis, a recent visitor to Philadelphia. The pontiff was wearing white vestments, Fishman pointed out. Ending the debate on a more serious note, Edmond challenged Fishman to compare his hospital’s infection data with Edmond’s after the Iowa hospital ho has started its BBE policy. He is confident there will be fewer hospital-aquired infections, he said. Editor’s note: An earlier version of this story misstated Dr. Edmond’s institutional affiliation. By the way, in spite of not having a white coat, some patient’s blood pressure runs higher in the office than it does at home. High Blood Pressure: How Low Should We Go? Declaring they had “potentially lifesaving information,” federal health officials said on Friday that they were ending a major study more than a year early because it has already conclusively answered a question cardiologists have puzzled over for decades: How low should blood pressure go? The answer: way lower than the current guidelines. For years doctors have been uncertain what the optimal goal should be for patients with high blood pressure. The aim of course is to bring it down, but how far and how aggressively remained a mystery. There are trade-offs — risks and side effects from drugs — and there were lingering questions about whether older patients needed somewhat higher blood pressure to push blood to the brain. The study found that patients who were assigned to reach a systolic blood pressure goal below 120 — far lower than current guidelines of 140, or 150 for people over 60 — had their risk of heart attacks, heart failure and strokes reduced by a third and their risk of death reduced by nearly a quarter. The study was expected to conclude in 2017, but considering the results of great importance to public health, the National Heart, Lung and Blood Institute announced. J. F Michael Gaziano, a professor of medicine at Harvard who was not involved with the study. He anticipated that it would have the same effect on people’s thinking about blood pressure as studies of about lowering cholesterol levels did when they showed that, contrary to what many had thought, the lower the number the better. If guidelines are changed because of this study — as blood pressure experts expect that they will be — an already falling death rate from heart attacks and stroke could drop even more, said Dr. Jackson T. Wright Jr., a blood pressure expert at Case Western Reserve University and University Hospitals Case Medical Center, and a study investigator. Because cardiovascular disease is still the leading cause of death in the United States, a change in blood pressure goals could also reduce the nation’s overall mortality rate, he said. The study ventured into unknown territory that some had found a bit frightening. A systolic pressure that is naturally 120 might be good, but it is quite another matter to artificially drag pressure down so low with drugs. Reaching a target that low would mean giving people more and more medications, and the side effects could cancel any benefit. Older people might be especially vulnerable to ill effects of a much lower blood pressure since many already take an array of drugs for chronic conditions, which might interact. A very low blood pressure could lead to dizziness and falls. Twenty-eight percent of the subjects in the new study were over age 75. I haven’t read the book, but the review makes it sound interesting. Providers are drowning in patients. As a result, you need to fight tenaciously to make sure that you get the best care. With gleaming hospitals, highly trained professionals, and ready access to new medicines and technologies, the American health-care system seems poised to provide the best care in the world—and sometimes it does. More often, explains Leslie D. Michelson in “The Patient’s Playbook,” people who are confronted by a serious illness discover that “there is no map.” There is no one with the time, information and stamina to coordinate, or “quarterback,” their care. Mr. Michelson seeks to change all this. He isn’t a physician, but he has spent the past decade delivering what might be called concierge medical quarterbacking—helping patients, generally people with a high net worth, manage complex medical challenges. Now he’s ready to share his “playbook” with the rest of us. The advice is often disarmingly simple. Prepare for illness when you are healthy. Get hold of your medical records. (You have a legal right to them.) Figure out which hospital you would want to go to in an emergency. He tells the harrowing story of parents who brought their jaundiced 2-day-old infant to the hospital where she was born, only to discover that the emergency-room staff there were used to adult patients and had minimal experience taking care of children. You might consider splurging for a primary-care physician in a concierge practice. If you want someone “who can give you an abundance of quality time at the drop of a hat,” Mr. Michelson writes, “then you should expect to pay extra for it.” But even if you cannot afford the concierge option, it is worth investing time in the selection process: develop a list of qualities you feel are important in a doctor, solicit recommendations, interview candidates. “Don’t start from the position that you can’t judge,” advises Mr. Michelson. For serious conditions, he counsels patients to seek out super-specialists—doctors who spend all their time thinking only about the disease you have. These experts tend to be found at top academic medical centers and are often deemed “in-network” by insurers, representing a rare health-care bargain. Above all, Mr. Michelson implores patients to be intensely involved in their own care. Many people, when speaking with a doctor about a health problem, “behave as if they were powerless,” he writes. Some become deferential; others just want to leave as fast as possible. He urges patients instead to “bring their A-game” to the doctor’s office. Use a trusted resource like the National Institutes of Health or the UpToDate medical website to educate yourself about your condition; then, during your appointment, take notes and ask questions. Vigilance is especially needed in hospital wards, where more than 10% of patients suffer a hospital-associated complication: a fall, an infection, an adverse drug reaction. Mr. Michelson’s counsel: Post a summary of your medical information near your bed and engage with the hospital staff so that you’re viewed as, say, a doting grandmother rather than merely the broken hip in Room 12B. Don’t take new medicines or submit to procedures in a hospital without understanding why they were ordered and insist that new symptoms—swelling, fever, pain—be promptly evaluated. Why such intense oversight? The answer, Mr. Michelson suggests, is that while doctors may have entered medicine “to develop strong emotional bonds with people and to help them through health challenges,” providers now find themselves overwhelmed, drowning in patients, process and data. As a result, you need to monitor your own care attentively—and tenaciously fight to ensure you wind up with the most experienced surgeon or, after a biopsy, the most expert pathologist. To his credit, Mr. Michelson advocates smart care, not more care. He devotes a chapter to the harms of unnecessary testing and gratuitous procedures, reminding readers that “overtreatment can be as dangerous as undertreatment.” A rush to treatment can also be a problem. Short of an emergency, it is important for patients, and doctors, to think things through. Mr. Michelson recounts the story of a man whose shortness of breath led him to a new doctor, a reflexively scheduled angiogram and the insertion of stents in his heart arteries well before a careful diagnosis had been made. The man’s problem, it turned out, wasn’t the heart but the lungs. The stent procedure was unnecessary. While Mr. Michelson asserts that his various strategies deliver improved outcomes for patients, he supports this view with anecdotes, not data. Leading care organizations like Kaiser Permanente and Florida-based ChenMed would surely contend that their own patients do at least as well as the tiger patients that Mr. Michelson touts—without the extra financial and emotional costs that the Michelson approach would often seem to entail. But “The Patient’s Playbook” isn’t offering policy; it’s offering practical advice, preaching what many physicians and health-policy gurus practice when a loved one gets sick. It’s a timely reminder that, in our worthy effort to improve the health of populations, we should not lose sight of medicine’s primary goal: delivering the best possible care to each individual patient. Dr. Shaywitz is chief medical officer of DNAnexus, a cloud genomics company, and a visiting scientist in the Department of Biomedical Informatics at Harvard. MELVILLE, N.Y. — FOR years, research on prostate cancer has sought an approach to screening that is more individualized than a one-size-fits-all measurement of the level of prostate-specific antigen in a man’s blood. These efforts are now paying off. When we use these markers together, these varied interpretations of PSA levels give us a clearer picture of who does, or doesn’t, need further testing. And we keep refining our approach. Already, a urine test can find and measure the presence of genes associated with prostate cancer. M.R.I. images can help identify high-risk prostate lesions. And tests for the presence or activity, or both, of genes present in prostate tissue can help distinguish which patients can safely defer therapy from those who cannot. Nevertheless, in 2012 the United States Preventive Services Task Force made official its recommendation that no asymptomatic man undergo screening with a PSA test. And that decision grew in importance when the Affordable Care Act elevated the task force’s recommendations from advisory to a basis for Medicare payment policies. Deepak A. Kapoor, a urologist, is a professor at the Icahn School of Medicine at Mount Sinai and chairman of health policy for the Large Urology Group Practice Association. This was a recent article on Doximity , a website for physicians, that highlighted generational differences in the way physicians practice medicine. It occurs in every profession, but medicine is one area where older doctors are very vocal in their criticism of the latest generation. I remember advising one medical student who was interviewing for residency programs to avoid using the word “lifestyle” to avoid alienating the interviewer. We think of it as a profession, a calling and they think of it as a job. New doctors are not kind to their predecessors. Here’s why. I had the good fortune of practicing family medicine from the 70s to the early 10s. It was the Golden Age. After doing a family practice residency in a community hospital and serving a short stint as an assistant residency director, I started out in my practice that lasted almost 40 years. Here is the story of how I got the ball rolling. I was part of a large family practice group. Dr. A was an elderly GP with a devoted patient clientele. His patients loved him. He gave them prescriptions, vitamins, B-12 and cortisone shots. He did use the lab and x-ray but never referred. He would diagnose an MI correctly and then treat the patient with follow-up house calls. He didn’t really know what a cardiologist or most specialists actually did. Maybe he was lucky, but we never heard that many of his patients died. Yet, he was paternalistic and pre-patient education. Our group decided he was a risk and delegated to me the thankless job of convincing him to retire. I was successful, and surprisingly he asked me to take over his patient load. During my practice career, I saw many, many patients that stayed with me my entire career including Dr. A’s patients. They must have sensed some of their beloved retired doctor in my style of practice, and they stayed with me and referred their family and friends. For most of my career, I had a lot of face to face and hand holding time, very little documentation, and minimal outside interference. I delivered babies for the first decade. I was a care coordinator, gatekeeper, and quarterback. I had a broad knowledge of medicine and a good skill level. I was practical and empiric yet didn’t skimp on testing and referring. I played by the book we used at the time. I knew everything about my patients. I always worked them into my schedule for emergencies. I treated their infections, their pain, their depression and many other things. I kept them working and when necessary gave them the permission for respite. When frail, I visited them at home or at the nursing facility, never delegating their care. I certified in Hospice and Palliative Medicine and was also able to provide excellent end of life care. And at the end I quickly became computer and EMR savvy and spoke Epic fluently. What was my reward? Lifelong “friends” that trusted my judgment, lots of positive feedback, and countless letters, gifts and calls of thanks. I had the respect of my colleagues. The ER doctors and specialists were in awe at the scope of my general knowledge, my ability to recall medications and medical histories without referring to the chart, and my thorough dedication to my patients. Eventually, age, employer micro-management, EMR documentation, and insurance/government regulations got the best of me, and I retired and moved away. My patients could not find another doctor that fit my mold and, therefore, were scattered throughout the area for their care, with most establishing with new young doctors. My patients still talk about me, send letters and emails, and update me on Facebook. Despite being gone from the scene, I am still special to all my patients. Not so, when it comes to my former colleagues. I can’t think of another profession where the practitioners from the previous generation are held in such low esteem. Former athletes are still remembered, admired and honored even though the training and equipment have improved the stats. Former pilots are well respected by the current generation of aviators who realize they have it a lot easier nowadays. No one puts down a former teacher or CPA by casting doubts on their ability to read or to add. Medicine is a field where rapid changes in technology and information make previous treatment and practices obsolete. I get that. Now that I am partially retired, I finally have ample time to read and think and evaluate. I know the “errors” of my ways but knew of no other ways back then. I know much more now about screening and testing and treating diseases. The point is, that’s the way the medical profession is. Technology and knowledge change from generation to generation. I understand and accept that the new generation of doctors can’t practice with the old knowledge or the old technology or in the old style. They inherit a broken healthcare system and patients with antiquated expectations. I am sure some good things are still said about the departing generation. “Dr. B” is a family physician. Do proton pump inhibitors cause heart attacks? For 12 years Group One, an electronic billing service in Jefferson, Missouri, has filed claims electronically for services that are not covered by our annual fee. They no longer will be able to do this in the coming months and we are going to bring that in house and have someone local do it for us. I will give you that information in the next newsletter. A suntan or sunburn is a sign that skin has been damaged by ultraviolet (UV) rays. Melanin is the pigment that gives skin its color. People with light skin have less melanin than people with dark skin. When skin is damaged by UV rays, the body makes more melanin to try to protect against further damage. This extra melanin gives suntanned skin its darker appearance. But a suntan does not provide good protection against the harmful effects of UV rays. In fact, a suntan is a sign that skin has already been damaged, and tanned skin can continue to be damaged when exposed to UV rays. For people with light skin, exposure to UV rays can lead to sunburn in as little as 10 to 15 minutes. The redness of a sunburn is caused by increased blood flow to skin that has been damaged. Exposure to UV rays is the leading cause of skin cancers, including basal cell carcinoma and squamous cell carcinoma. These cancers often occur on skin that has been damaged by years of sun exposure, although they can occur on other areas of the body as well. If you tan frequently or have a history of severe sunburns, you are also at an increased risk of melanoma, the most dangerous type of skin cancer. Exposure to UV rays increases the risk of premature skin aging and may also increase the risk of eye problems such as cataracts, macular degeneration, and corneal damage. Indoor tanning is not a safe alternative to sunbathing. Tanning beds, booths, and lamps produce a similar amount of UV radiation as the sun. Skin damage (a tan or a burn) from indoor tanning increases the risk of skin aging, skin cancer, and eye problems, just like damage from sunlight. Apply broad-spectrum, water-resistant sunscreen with an SPF of 30 or higher before you go outside. Use plenty of sunscreen—about 1 oz (2 tbsp) for your whole body. Do not use sunscreen that is past its expiration date. Reapply sunscreen after 2 hours in the sun and after swimming or sweating. 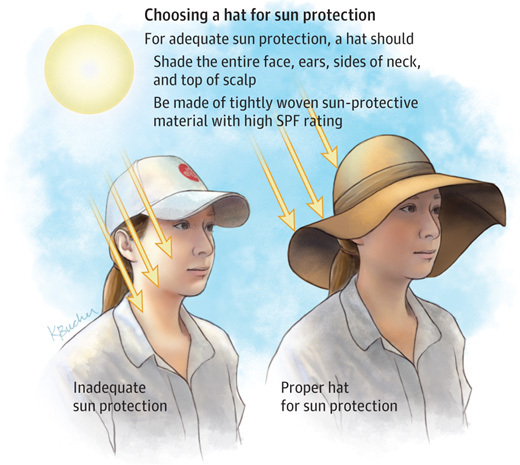 While outdoors, wear sunglasses and a hat with a wide brim (about 4 in) all the way around it. Wear protective clothing (tightly woven long-sleeved shirts and long pants or skirts offer the most protection). Limit your time in the sun and seek shade, especially between 10 am and 4 pm. Remember that skin damage from the sun can occur on cloudy days. Pain from a sunburn is usually worst between 6 and 48 hours after sun exposure. A cool bath, cool compresses, and over-the-counter medicines like ibuprofen or acetaminophen can help. Drink water to stay hydrated. If your skin is not blistered, apply moisturizing cream or aloe vera gel to help with discomfort. Extreme sunburn can lead to shock, dehydration, and other serious reactions. If you experience rapid heartbeat, rapid breathing, dizziness, fainting, nausea, chills, fever, or headache with a sunburn, call your doctor right away. I tell patients to try to avoid exposure when your shadow becomes shorter than your height.